As one the country’s strongest one design classes, the E Scow National Championship is an immense gathering of fleets from the Midwest, East Coast, Rocky Mountains and Deep South. 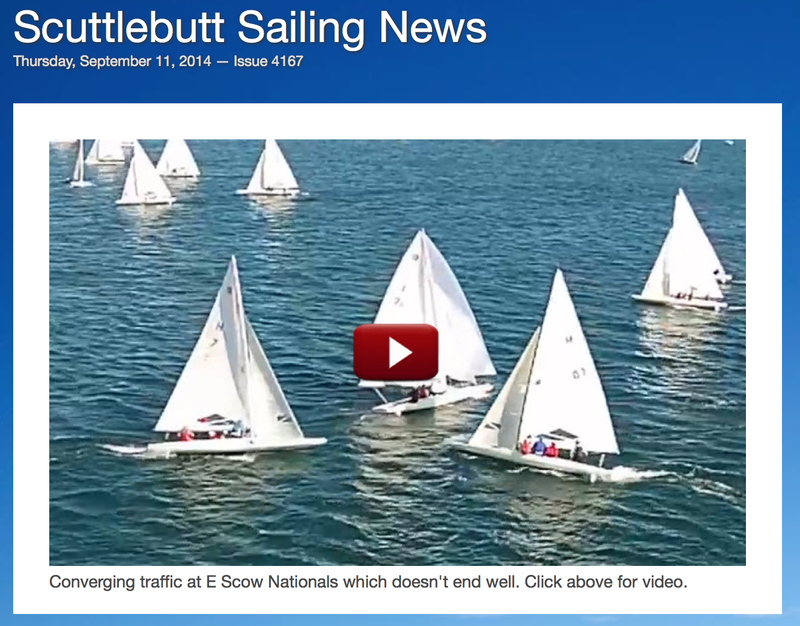 The 2014 edition on September 5-7 attracted 79 boats to the beautiful shores of Crystal Lake in Michigan, and as with any E Scow Nationals, the sailing, partying and reunion type feel of the regatta left a lasting memory for the participants. More than just another regatta, the E Scow Nationals is a collection of family and long time friends that all have the same things in common; racing fast, nimble, stable boats in incredible venues against some of the best sailors in the country. Looking at the results not only reveals the talent of the event, but also the family feel with six family names (Porter, Jewett, Melges, Burdick, Harrett, Hughes) making up 20 of the 40 sailors occupying the top ten in the standings. When the regatta concludes with the awards presentation, emotional speeches, hugs and making plans for the same regatta next year are common place. After a slow start on Friday due to tricky breeze following passing storms, PRO Bruce Gollison made the most of a beautiful sea breeze off of Lake Michigan with 5 races on Saturday and Sunday, and treating the gathering to the best racing possible. The top three were separated by only two points, with the team on M-42 from Lake Minnetonka of Sam Rogers, Chrisy Hughes, Tony and Lynn Jewett making a late comeback the final race to grab the title, holding off 13 year old Harry Melges IV with his Dad, Harry Melges III trimming jib, and a strong charge from Jeff Bonani who won the last two races to finish 3rd overall. Full results. Sean Fidler provides this video of drone footage from the racing.